Tempered glass is expensive but necessary for some home remodels-window film can be used as a cost-effective alternative though. Anyone who has ever done a home remodel knows just how expensive they can get and how they can drag on for what seems like forever. The flip side of this is–once done, you get to live in the home of your dreams. One problem that comes up a lot during remodels is the need to bring your home up to code in order to proceed with the project. Basically, in order to get a permit to make structural changes, you must also agree to bring other parts of your home that are out of code, up to date. Windows are one of those areas that often are out of code, especially in older homes. They are also very expensive to retrofit with the required shatter-proof or tempered glass in places like bathroom and stairwells as well as sliding glass doors or large plate glass windows. The cost for this can be many thousands of dollars depending on the scope of these projects–and could easily blow your remodel budget. However, an easy and affordable workaround for retrofitting windows and doors with tempered glass during your remodel is safety window film. Can Safety Window Film Used Instead Of Tempered Glass To Bring Salt Lake City Remodels Up To Code? As mentioned, glass areas deemed hazardous are required by building codes to have glazed/tempered glass installed in our around them. However, an acceptable substitute for this and one that is easier on the budget is 3M Safety Window Film. This safety film meets code requirements but costs much, much less than replacing the glass in these locations. It is also very easy to have installed and takes much less time than full window replacement. 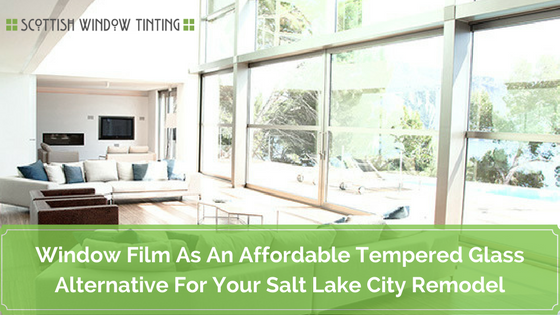 In fact, it can be installed in as little as one day, making 3M safety window film a smart alternative to tempered glass when it comes to your Salt Lake City home or commercial remodel. Don’t let your remodel get the best of you. Get your windows up to code the right way and for a fraction of the cost of full window replacement by contactinghttps://www.scottishwindowtinting.com/contact/ Scottish Window Tinting today!